Radiotherapy is an important treatment modality for cancer, as an estimated half of all cancer patients receives radiotherapy in the course of their cancer management. For such treatment, high dose of radiation is often associated with a spectrum of normal-tissue toxicity. For example, radiation-induced fibrosis is a common and often permanent late effect that can develop in skin and subcutaneous tissue, the gastrointestinal and genitourinary tracts, muscles, or other organs, depending on the treatment site. Clinicians can recognize post-irradiation fibrosis, but quantifying the severity remains a challenge. We have developed noninvasive, quantitative ultrasound technologies for accurate assessments of radiation-induced normal-tissue toxicity. These quantitative ultrasound methods are being investigated in breast, GYN, prostate and head-and-neck cancer radiotherapy. 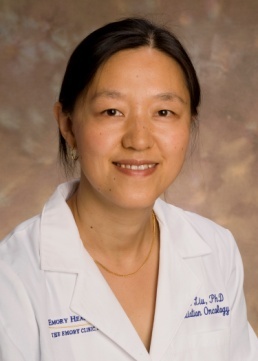 Dr. Tian Liu received her PhD in medical physics from Columbia University. Her primary research in the detection of prostate and breast cancer using multimodality imaging has been funded by the National Cancer Institute and the U.S. Department of Defense. She has developed theoretical models to describe the interactions between ultrasound waves and biological tissues. Over the past 5 years, her group has pioneered the use of functional ultrasound imaging in monitoring and predicting normal-tissue toxicity in cancer radiotherapy. Through this work, radiation oncologists will be able to better understand radiation-induced side effects and hence improve the quality of life of many cancer survivors.